Sam Roberts produced a sensational individual performance as Bexhill Cricket Club’s first team chalked up another victory. The in-form club coach scored 115 with the bat and took seven wickets with the ball to fire Bexhill to a 56-run success at home to Billingshurst on Saturday. The result completed a Sussex Premier League double for Bexhill over second-bottom Billingshurst and Roberts has picked up 12 wickets in the two games. After Bexhill won the toss and chose to take first knock, Roberts batted superbly and shared in fifty partnerships with all of the first four batsmen as maximum batting points were secured. Roberts and Malcolm Johnson (22) got Bexhill off to a good start with an opening partnership of 69 before Roberts and Shawn Johnson, who made 38 off 41 balls, added 62 for the second wicket. 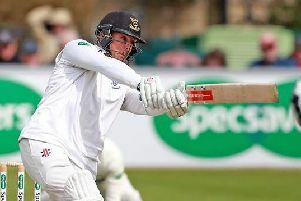 Callum Guest (21) and Roberts forged a third wicket stand of 52 before Roberts brought up his century, eventually being sixth man out with the score 234 having hit 14 fours and two sixes in the 161 balls he faced. Ian May blasted 14 off 12 balls before Bexhill declared on 253-8 from 53 of their allotted 58 overs. Tom Hayes was by far Billingshurst’s top bowler with 5-45 from 15 overs. Bexhill quickly had Billingshurst in trouble after tea. Joe Cox (8-3-30-3) bowled Stuart Barber and then had Mahesh Rajaratne caught behind to leave the visitors 17-2. Roberts then got in on the act, dismissing Dan Doram for 18 and Mike Burroughs for a golden duck with the score 36. And when Cox had Tom Haynes caught by Roberts for 16, Billingshurst were 40-5. Roberts pinned Andy Barr lbw for three to make it 57-6, but Billingshurst refused to roll over. Scott Stratton led the resistance, firstly in a seventh wicket partnership of 51 with Jay Hartard, who was bowled by Roberts for 16. Stratton then found another ally in the form of Tim Weston and the pair put on 78 for the eighth wicket only for Roberts to dismiss them both with the score 186, firstly Weston for 24 off 55 balls and then Stratton for a defiant 98 from just 84 deliveries. Roberts fittingly had the final word 11 runs later, causing Shane West to offer an easy catch to Shawn Johnson at bat-pad. Roberts finished with 7-69 from 17.1 overs - his first seven-wicket haul for Bexhill. Standings (played-points): 1 Horsham 11-221, 2 Roffey 10-211, 3 Cuckfield 11-206, 4 BEXHILL 10-187, 5 East Grinstead 11-184, 6 Preston Nomads 11-165, 7 HASTINGS PRIORY 10-154, 8 Brighton & Hove 11-148, 9 Billingshurst 11-93, 10 Worthing 11-90.